Feel the wind whistling through your hair, which suddenly dies as you come to a halt and you are surrounded by silence and vast amounts of space. Quad biking across Botswana's Salt Pans is definitely one hell of a ride. 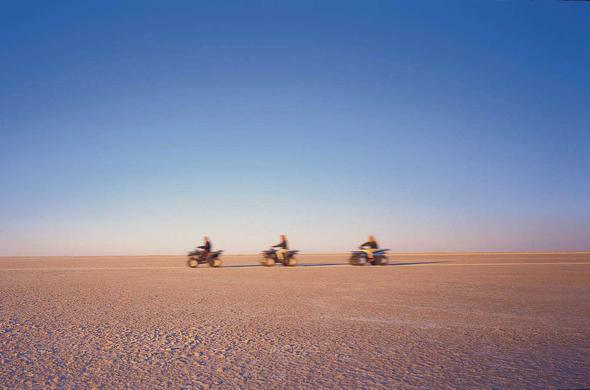 One of the "must-do" activities when visiting the Salt Pans region of Botswana is going quad biking. The landscape here is perfect for it, as there are no obstacles or difficult terrain. Many of the camps around the Salt Pans offer quad biking excursions, either as day trips or overnight trips to Kubu Island. Kubu Island is a unique geological feature that stands out in this flat and desolate land. The Makgadikgadi Salt Pans are the last remnants of a vast saline lake that dried out thousands of years ago, leaving behind a salt crust that is barren and rather devoid of life. Parts of the pans flood during the rainy season, so quad biking at some of the pans is a seasonal activity. This is a safari experience with a difference - you will head out into the vast nothingness of the pans. The horizon just disappears into nothingness in the distance. This expedition will give you a new appreciation for space! There is very little life out on these pans, and it is said that it can be so silent at times that you can hear nothing apart from your blood circulating through your ears.When on a quad biking expedition you will first be briefed by your guide about safety before you set off on your own 4x4 quad bike. You will travel in single file, well spaced and race across the pale white- grey sands. You will experience the thrill of racing across the sands at speed with no obstacles in your way. You will be led by an experienced guide who will tell you more about the geological forces that created the salt pans. The guide will also help you search for anthropological artefacts. In the Stone Age early humans relied on the vast inland sea that existed here and you can find examples of their tools. You can also keep a look out for hardy animals that have adapted to life on the edge of this harsh environment such as Aardvarks and Bat Eared foxes or if you are very lucky you might even see one of the Lions that have adapted to life in this arid region.